With a sheen and response that outshines its asking price, the V69 Mogami is a gem. Airy top end. Solid suspension mount. Keen price. There are plenty of affordable valve microphones around these days, both from well-established and less well-known companies. The MXL brand probably falls into the latter category in the UK, but it's is no Johnny-come-lately, as it's actually the pro audio division of US parent company Marshall Electronics, which has been active in audio for almost 30 years. The Mogami brand of high-quality cable also comes under the Marshall umbrella, hence the tie-in with MXL to give us the V69 Mogami Edition - a version of the V69 valve mic complete with Mogami cabling, both externally and internally. The V69 comes in a fairly solid attaché case with all its associated accessories, which include a power supply with IEC mains lead and a 15-foot, seven-pin connecting cable to the mic, a 15-foot Mogami XLR cable, a suspension cradle and a grey windshield. The mic itself seems nicely put together, although the gold grille is made of a quite fine mesh which looks like it could easily get dented if handled too roughly. What you get is a side-entry cardioid pattern only mic with no switching options - ie, no pad and no low frequency filter. It features a 25mm diaphragm capsule and comes with a frequency plot that shows a response that remains pretty flat throughout the range but exhibits a distinct rise from 5kHz up to about 12kHz before the response gently starts to drop off. Designed well and made from metal, the suspension cradle holds the mic securely and is easily set at any angle via a T-shaped adjusting screw that takes very little effort to get finger tight. "What you get is a side-entry cardioid pattern only mic with no switching options - ie, no pad and no low frequency filter." After making all the connections, switching on the power and waiting a few minutes to give the valve a chance to get up to operating temperature, we used the mic initially on a session recording acoustic guitar and ukulele. The resulting sound was clean and crisp in the top end while retaining plenty of body in the mid range. Our overall impression was that the rise in the frequency response enhanced the sound somewhat with a nice sparkle - no bad thing on acoustic guitar. The expectation was that the mic's top end response could be a boon when recording vocals and this was borne out in practice with the achieved result being a detailed, naturally warm vocal recording, exhibiting plenty of presence without sounding at all harsh and with an airy top end sheen. The voice sat well in the mix without us having to resort to any extra EQ. The lack of a pad switch or filter may make the MXL V69 Mogami Edition appear less versatile than some of its rivals but in practice neither of these omissions is of great concern. A max SPL handling of 140dB is more than adequate for the types of tasks this mic is most likely to be used on and low end can always be filtered out elsewhere in the signal chain if desired. Overall, it has to be said that the V69 sounds really good and compares very favourably with more expensive rivals. 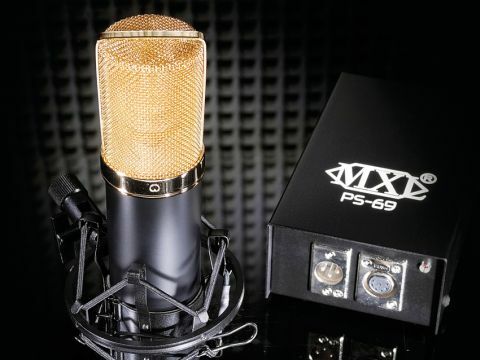 If you are looking for a large diaphragm condenser, primarily for vocal recording but capable of more, particularly where top end is important, the V69 will give you quality results that belie its asking price.